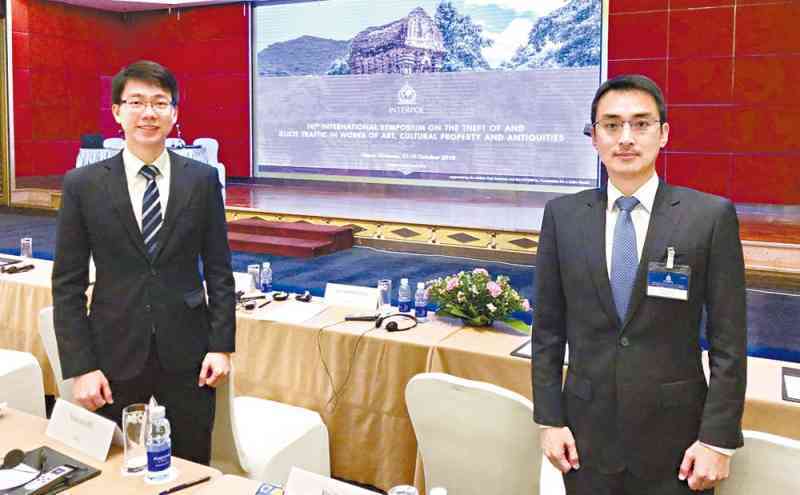 Chief Inspector Chow Hok-yin and Senior Inspector Wong King-shing of the Organized Crime and Triad Bureau (OCTB) attended the 10th International Symposium on the Theft of and Illicit Traffic in Works of Art, Cultural Property and Antiquities from October 17 to 19 in Hanoi, Vietnam. The symposium, held by the INTERPOL, drew the participation of 130 delegates from 80 member countries and regions, including representatives from law enforcement agencies and academic institutions. The symposium provided a platform for the delegates to share their experience, difficulties and challenges in tackling the theft and illicit trafficking of cultural property. Experts from international organizations, including the United Nations Educational, Scientific and Cultural Organization, the World Customs Organization and the European Union's Counter Terrorism Unit, talked about the latest trend in the illicit traffic of looted cultural property and its impact on the international community. The delegates deliberated on the issue of organized crime syndicates and terrorists raising money through illicit trafficking of cultural property. They also explored ways to strengthen international co-operation and intelligence exchange to combat related crimes.